The generation of The Soil Map of Australia by James Arthur Prescott in 1944 was a huge project with significant benefits over a long period of time. It started with his publication in 1931 of The Soils of Australia in Relation to Vegetation and Climate (CSIR Bulletin Number 52) which described his examination of the distribution of the major groups of Australian soil types (he identified nine) and the corresponding vegetation associations (he described eleven). Over the next decade or so his activity in soil classification and mapping on a continental scale extended to include a study of laterite in India and Thailand. His extensive travels in Australia, particularly in the northern part of the continent, continued until the outbreak of World War II. The mass of information collected found expression in a more detailed and larger scale map (1:10 x 106) of the soils of Australia that was published in 1944 as A Soil Map of Australia. This displayed eighteen mapping units, three of which were essentially physiographic rather than pedological. This map continued to reflect and sum up existing knowledge of Australian soils until it was ultimately replaced by a series of maps compiled and published by a number of younger colleagues in the 1960s and 1970s. After four years at Rothamstead Experiment Station at Harpenden, Herts, UK and eight years as Chief Chemist and Superintendent of Field Experiments at the Sultanic Agricultural Society of Egypt, Prescott arrived in South Australia on 9 September 1924 to take up the position of Chair of Agricultural Chemistry at the University of Adelaide. Following his appointment to the Waite Agricultural Research Institute, Prescott’s interests, as at Rothamsted, were dominated almost exclusively by soil science. He first set out to establish accurate chemical and physical methods of soil analysis, later concentrating on soil classification and cartography and climatology. Concurrent with his University appointment he was the Foundation Chief of the Division of Soils CSIR (part time) from 1929 to 1947 and Director of the Waite Agricultural Research Institute from 1938 to 1955. He had met ACD (later Sir David) Rivett prior to Rivett becoming Chief Executive Officer CSIR in 1926. Rivett sought Prescott’s advice regarding the concerns of both State and Federal authorities about the increasing problems of salinity and waterlogging in the irrigation areas of the Murray and Murrumbidgee River valleys. Following discussions with the various irrigation authorities in New South Wales, Victoria and South Australia, Prescott, in August-September 1926, made an inspection of all the irrigation areas involved, proceeding from east to west. As a result of his inspection, Prescott suggested the setting up of a Soil Investigation Section under his leadership at the Waite Institute. This was implemented in July 1927 by the appointment of JK Taylor, who had detailed soil survey experience in California, and of HN England. They commenced the long task of soil surveying all irrigation areas of the riverine region with a detailed survey of Block E, a part of the Renmark Irrigation Area. The equally necessary stratigraphic and groundwater studies of the region were the responsibility of the Geological Surveys of New South Wales, Victoria and South Australia. At this time Prescott became Chairman of CSIR’s Irrigation Research Station Committee. By 1929 the Soil Investigation Section was renamed the Division of Soils of CSIR and, with Prescott as its first Chief on a part-time basis, its function was widened to embrace the study of the soils of Australia as a whole, a franchise only possible in a Commonwealth instrumentality. Prescott had already commenced the classification and mapping of Australian soils on a continental scale. Early in 1929 he appointed CG Stephens to do detailed studies of non-irrigated lands, such as the apple-growing soils of Tasmania, and to study the soils of that State on a broad scale. This proved to be the first step in the regionalisation of the Division’s activities, an expansion which was accelerated in 1945 by greatly increased demands for soil survey work. Stephens was transferred to Adelaide in 1938 and in 1941 became Head of the Soil Survey and (later) Pedology Section in which capacity he produced a Manual of Australian Soils that described and defined the Great Soil Groups, the basic concept of which Prescott had introduced to Australia. Prescott and Taylor introduced detailed soil mapping based on soil series and types derived from the meticulous description of the different horizons, i.e. apparent layers, in the soil profile when inspected at frequent intervals on a basic grid pattern. Prescott also made use of the soil profile more widely observed and broadly classified as Great Soil Groups, and took greater account of the dominant soils in the landscape. This combination of analyses enabled both localised detailed soil surveys and the continental mapping of the soils of Australia to proceed simultaneously. This constituted a revolution in soil science in Australia for it broke sharply away from the older technique based subjectively on the texture of the surface soil, its stoniness or otherwise, its surface relief and associated vegetation. These attributes were used to set up categories of land rather than soil, usually termed either first, second or third class and implying its degree of suitability for a given form of land use ‘ be this some form of arable agriculture, or the grazing of improved or indigenous pasture, or the establishment of forest plantations. To accomplish his objective, Prescott pursued two routes of investigation: he read and interpreted a great number of reports existing in various State Departments and Archives dealing with both early explorations and later surveys of land, and he travelled widely throughout Australia observing soils not only while travelling on the ground but also from aircraft. In the latter case he kept detailed notes of times of departure and arrival and of the appearances of changes in the patterns of landscapes observed from the air. Quite early he was convinced that vertical aerial photography would be of great assistance in detailed soil surveys. However, at that time such aerial photographic cover was so meagre that special arrangements with either the Royal Australian Air Force or private air photo companies for air photographs of project areas at suitable scales had to be made. At first the photographs were used as an aid in the drawing office, but by the late 1930s they were used in the field for the direct correlation of soil series and types with observable features on the photographs and for the delineation of boundaries between the different soils. In the decade 1927-37, Prescott travelled throughout Australia from Tasmania in the south-east to the Kimberley region in the north of Western Australia, including an expedition to Lake Eyre with CT Madigan in 1929. His 1930 soil map of Australia was, as titled, tentative in nature and of very small scale (1:40 x 106). 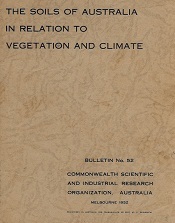 It was essentially a preliminary to that of 1931, published in CSIR Bulletin 52 as The Soils of Australia in Relation to Vegetation and Climate and at a scale of 1:19 x 106. It used ten mapping units some of which were combinations of Great Soil Groups. Left panel: sclerophyll woodland with salmon gum (Eucalyptus salmonophloia). The publication of The Soils of Australia in Relation to Vegetation and Climate established Prescott’s reputation not only within Australia but also internationally. It was the principal paper in a set of publications that he submitted to the University of Adelaide and for which he was awarded the degree of Doctor of Science in December 1932. Demand for the paper was such that the First edition went to two printings, the supplies of which were exhausted prompting a second edition, which included a new map prepared by Professor JG Wood, being released in 1952. Prescott continued his activity in soil classification and mapping on a continental scale and extended his study of laterite to India and Thailand when the opportunity came later. His extensive travels in Australia continued, particularly in the northern part of the continent, until the outbreak of World War II. The mass of information collected found expression in a more detailed and larger scale map (1:10 x 106) of the soils of Australia that was published in 1944 as A Soil Map of Australia. This displayed eighteen mapping units, three of which were essentially physiographic rather than pedological. It continued to reflect and sum up existing knowledge of Australian soils until it was ultimately replaced by a series of maps compiled and published by a number of younger colleagues in the 1960s and 1970s. During 1948, Prescott was a member of a scientific delegation to India where he took the opportunity of studying a number of occurrences of laterite. On the completion of the mission he travelled to Siam, now Thailand, where by arrangement he met RL Pendleton from Johns Hopkins University, Bethesda, Maryland, USA. Pendleton had studied soils in several countries in south-east Asia and held views somewhat different from many of his American colleagues about the nature of laterite. Prescott and Pendleton studied laterite and its companion soils over a wide area of Siam and found themselves in general agreement. In 1952 they published Laterite and Lateritic Soils in Communication No. 47 of the Commonwealth Bureau of Soil Science. In 1954, Prescott emphasised the need to adhere to the early definition of laterite by Buchanan by publishing a paper on ‘The Early History of the Use of the Term Laterite’. In recognition of Prescott’s service to Australian science, he was made a Companion of the Order of the British Empire in 1947. He was elected Fellow of the Royal Society of Arts in 1948, Fellow of the Royal Society, London in 1951, and a Foundation Fellow of the Australian Academy of Science in 1954. In 1956, the Centenary of the University of Melbourne, that body conferred on him the Honorary Degree of Doctor of Agricultural Science. In 1971, the Australian Society of Soil Science established the JA Prescott Medal to be awarded for outstanding contributions to soil science and climatology. Prescott said that this action gave him more pleasure than any other honour accorded to him. In 1980, the Waite Institute and the CSIRO Division of Soils held a two-day symposium to honour his ninetieth birthday. The major purpose of the symposium was to recognise his distinguished contributions to Australian agriculture and agricultural research through the disciplines of soil science and climatology. The proceedings, Red-brown Earths of Australia, were published in 1981.